This week I had an observed lesson, where the remit was that I do something risky that I perhaps wouldn’t have done otherwise. 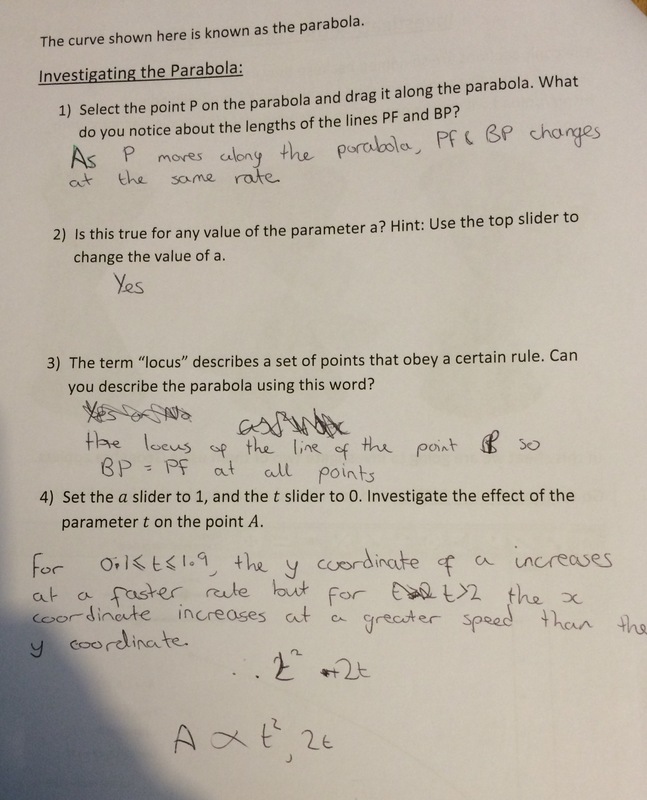 My Year 12 Further Maths class had been selected as my observation lesson – I found thinknig of something risky to do with them harder than if it had been any other group. They are used to me doing odd things, that are a bit off the wall with them and they always respond well. In the end I decided to use ICT and try to get them to do some independent discovery work. 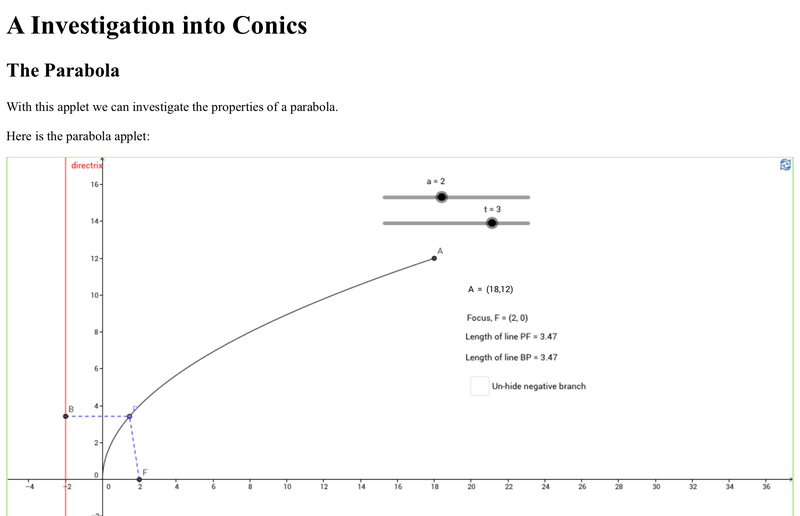 We have just started the coordinate geometry section of FP1 (Edexcel) and wer due to look at the parabola this week. I have used GeoGebra a bit in the past but I had never created my own geogebra worksheet before and this seemed like the perfect opportunity. 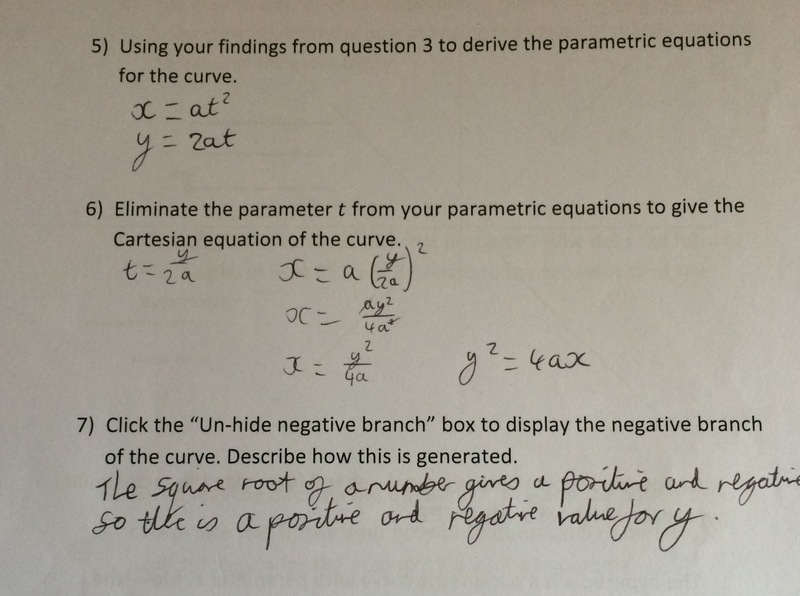 I then wrote a sheet with some questions to guide the students’ explorations here, these questions should prompt them to derive the parametric equations of the parabola and notice the focus-directrix property. It is significantly harder to answer the questions concerning the hyperbola – I saw these as hard extension questions. All of my class seemed to enjoy using these and engaged well with the work. Walking round the room I also saw some great responses to questions. To produce the worksheets, upload to GeoGebra Tube and then host on my website took in total about 2 hours which I don’t think is bad for a first time. My intention is to use GeoGebra moe across the keystages, any worksheets I create I will share through my website as well as GeoGebra Tube. The original GeoGebra files (in case you want to modify them) are here (parabola) and here (hyperbola). I will also be adding a worksheet for the Ellipse to the webpage later too. Update: Please be aware that for the web applets to load there has to be communication with the GeoGebra website, so make sure that is not on your schools block list.